I have fallen in love with this, and will definitely be making one for little ones in our family. From Forty-Two Roads.com: This little kitchen unit is built entirely from recycled (as in, salvaged from the dumpster) corrugated cardboard covered in contact paper. No glue, no nails, nothing but clever joining cuts make the kitchen entirely disassemble so it can be packed flat for moving/storage. 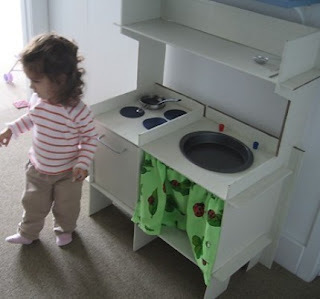 • 18 DIY Play Kitchens so Amazing You'll Want to Cook in Them Yourself!